As Gideons shared Scriptures with thousands and thousands of students, they saw a harvest of souls, as many prayed to receive Christ. The Gideons International partners with churches in 200 countries, territories and possessions to reach lost men, women, boys and girls with God’s Word, so that lives may be transformed by the Gospel as they receive Jesus as their Lord and Savior. 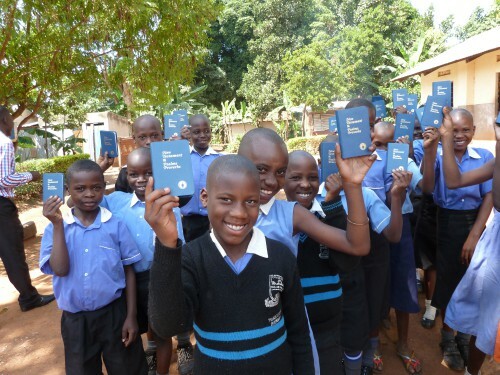 One of the countries where Gideons place and distribute God’s Word is Uganda. Gideons in Uganda prepare for reaching the lost through Scripture distributions in the 2016 Uganda International Scripture Blitz. This June, Gideons and Auxiliary hosted the 2016 Uganda International Scripture Blitz in the cities of Hoima and Masindi. Gideons from the USA and the British Isles also came to Uganda to help carry out the distributions. Gideons in Uganda did an excellent job of planning for the blitz. Transportation, which can be a big challenge in such rural areas, was in place and Scriptures were boxed up and waiting for distribution. Some roads the teams drove on had not seen any automobile traffic in weeks or months. The first Sunday in Uganda, one team member presented at a local church that partners with The Gideons International. In these churches, it is not uncommon to see people bringing produce such as bananas or mangos as their offering. 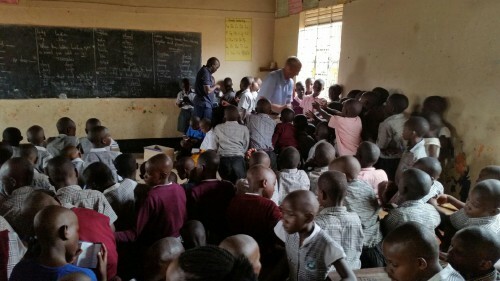 A collection was taken for The Gideons International and the total amount was about 40,000 shillings, which equals about $15 USD. Given that the annual wages for 60 hours of labor a week in Uganda would likely be less than $500, the collection total was an example of people giving abundantly, even in their lack. 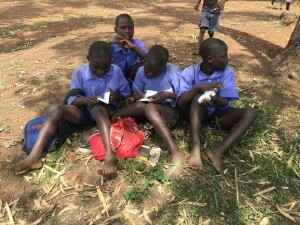 Students in a Uganda school classroom line up to get their Scriptures from Gideons. Tim Thuemling is a Gideon from the Waukesha West Camp, Wisconsin/Upper Michigan. As a partner in a manufacturing company, he shifted his focus from his busy schedule to help out in this Scripture blitz. One of the blessings Tim experienced occurred as the Word of God was placed at a large health clinic. By the end of the placement, 21 souls had received Christ. “What a joy, as these people came in search of physical healing, and instead left the clinic with the pure spiritual healing that only Jesus Christ can provide,” says Tim. Schools were just starting back for the summer, and for the first few days, student attendance was very light. By the end of the week, attendance was back to normal. 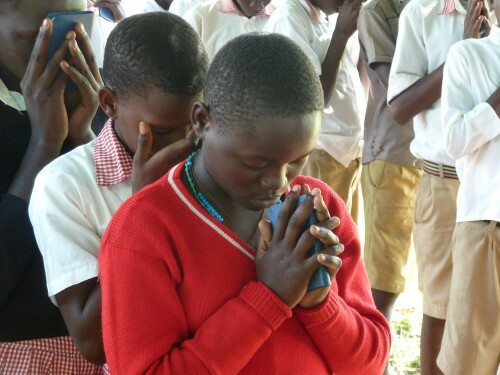 As Gideons made their distributions, the students bowed after receiving their Scriptures as a sign of respect. In Masindi, Gideons arrived at a military base to distribute Scriptures at two schools inside the base. When they approached the officials, the team was turned away because they did not have all of the required authorizations. That night at the hotel, the team shared their experience with some of the other Gideons. A Gideon employed by Uganda’s Department of Defense, accompanied the team the next day as they returned to the base. As the other Gideons prayed for an open door, the Gideon was able to speak with the military officials and secured the opportunity to distribute Scriptures. Those open doors allowed about 1,600 students and faculty to receive Scriptures that day. At a prison in Masindi, Gideons distributed over 1,300 Scriptures to inmates and were able to deliver a full presentation of the Gospel. When they offered the prisoners an invitation to receive Christ, 44 inmates came forward ready to place their faith in Jesus. 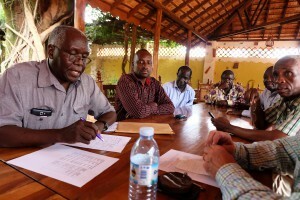 Gideons saw evidence that other Gideons had been to Uganda’s uttermost areas years ago. They met one woman who received a Scripture at a school when she was a child. It led to her receiving Jesus as her Lord and Savior. Today, she is the director of a school. They also met another woman who grew up in a Muslim home in Uganda. As a child, she received a New Testament from Gideons. After reading it, she placed her faith in Jesus, and today she is a school teacher. Blitz participant John Coldwell has operated a travel agency for the past 20 years in the British Isles. While he has made travel arrangements for many other Gideons on International Scripture Blitzes, the Scripture blitz in Uganda was his first to participate in himself. A group of boys explore their New Testaments after receiving them from Gideons during the 2016 Uganda ISB. “I was greatly impressed by the children,” says Coldwell. “They were polite, courteous, obedient, joyful, and thoroughly charming.” At each distribution, Coldwell told the children how precious they were, how much God loved them, and how much He desired they love Him back. 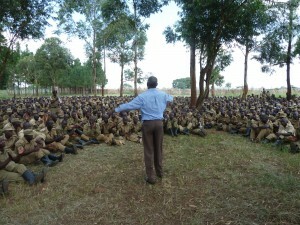 A Gideon presents the Gospel to Ugandan police cadets at a Scripture distribution. By the end of the blitz, 80,717 copies of God’s Word were sown in Hoima and Masindi. We praise God for the open doors and receptivity the Gideons experienced during this blitz. We pray that as men, women, boys, and girls read the Scriptures received, they will place their faith in the Lord and continue to draw closer to Him. We thank the pastors, churches, donors, and others who supported this blitz through their prayers and donations.